This DIY kit includes everything you need to make your own cinnamon whiskey--just add alcohol. Warm up your whiskey with this DIY infusion kit. Just add your favorite bourbon, rye, or other whiskey--the kit has everything else you need to produce a wonderfully warming batch of spicy cinnamon liqueur. It includes a 500 ML Italian glass bottle with built-in cap and custom-designed label, a 4-inch funnel, a natural coffee filter, and a vial of 100% organic botanicals with easy instructions to transform your whiskey into a libation redolent with cinnamon, grains of paradise, and cardamom. The label invites customization to record your cocktail creation. Assembled in Nevada by cocktail-loving couple Ryan and Melanie Belshee. Refill kits also available to keep the drinks flowing. 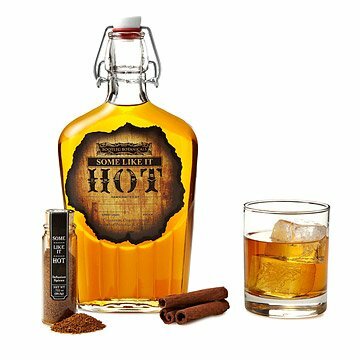 Spicy Cinnamon Whiskey Infusion Kit Includes: spices and botanicals, instructions, 500 ML swingtop bottle, One 4" stainless steel funnel, one natural filter. Refill Includes: spices and botanicals. Yields 500 ML of Spicy Cinnamon Whiskey. Estimated brew time: 48 hours. I would have loved yo see this product offered in a no sugar option. I gave this as a holiday gift and my friend loved it. He said the instructions were easy to follow and he's looking forward to his first sip! THE INFUSION WAS QUICK AND EASY AND THE FLAVOR WAS SPOT ON. Got this as a gift for my brother and he loved it.